Cleaners Putney provides professional and top quality carpet cleaning services in Putney, London at one of the most competitive prices. Having a beautiful and quality carpet or a rug in the living room or in any place at your home makes the whole area more comfortable. However, carpets and rugs requires good care on a regular basis if you want to maintain their original appearance. That is why most of the carpet manufacturers recommend to use the services of professional cleaning company at least once in a year. It is important to hoover your carpets on a regular basis, but only the method of steam cleaning can deep clean the carpet. This is the only way to ensure that all the dust and dirt is removed from the fibers. Moreover, through the method of steam cleaning, also known as hot water extraction, we are able to remove most of the stains. When you request our service, we ask you to provide details about the material of the carpet and regarding any visible stains. Once done, our carpet cleaners will know what is the best cleaning method for your carpet. 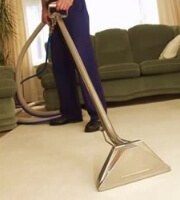 We use the method of steam cleaning for all carpets except for those made of organic material. Below you can find more information about the technology and the procedures we use. Do not hesitate to contact our customer support team. We work seven days a week and help you decide what is the most relevant cleaning solution for you.